An awesome place to go for a short hike in Saanich is Bear Hill. 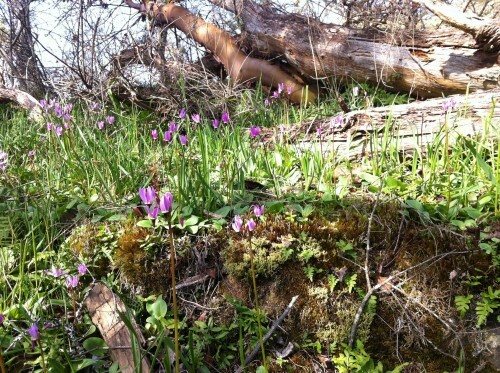 Early April, when the wild flowers are already out, there are a lot of great spots to go for a hike around Victoria. When you hike up Bear Hill though you can almost be certain to always see eagles, ravens, turkey vultures, and hummingbirds. It's especially enchanting in early spring, walking through carpets of fawn lilies and shooting stars, chocolate lilies and camas, and listening to the song sparrows and golden-crowned kinglets. Mt. Baker on the horizon. You almost want to spread your wings and fly with the eagles, it's so inviting. Dan's Farm. Stop for a cup of coffee and a cinnamon bun at Dan's Farm, buy organic groceries, or feed the goats. An awesome stop for the whole family.